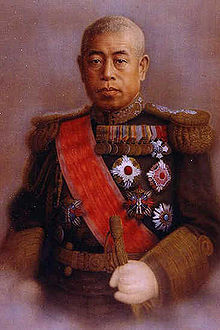 Isoroku Yamamoto (4 April 1884 – 18 April 1943) was a Fleet Admiral and Commander-in-Chief of the Imperial Japanese Navy (IJN) during World War II. He was a graduate of the Imperial Japanese Naval Academy and an alumnus of the U.S. Naval War College and Harvard University. He died during an inspection tour of forward positions in the Solomon Islands when his transport aircraft was ambushed by American P-38 Lightning fighter planes. His death was a major blow to Japanese military morale during World War II. A military man can scarcely pride himself on having "smitten a sleeping enemy"; it is more a matter of shame, simply, for the one smitten. Should hostilities once break out between Japan and the United States, it is not enough that we take Guam and the Philippines, nor even Hawaii and San Francisco. To make victory certain, we would have to march into Washington and dictate the terms of peace in the White House. I wonder if our politicians, among whom armchair arguments about war are being glibly bandied about in the name of state politics, have confidence as to the final outcome and are prepared to make the necessary sacrifices. As quoted in At Dawn We Slept (1981) by Gordon W. Prange, p. 11; this quote was stated in a letter to Ryoichi Sasakawa prior to the attack on Pearl Harbor. Minus the last sentence, it was taken out of context and interpreted in the U.S. as a boast that Japan would conquer the entire contiguous United States. The omitted sentence showed Yamamoto's counsel of caution towards a war that would cost Japan dearly. Statement to Japanese cabinet minister Shigeharu Matsumoto and Japanese prime minister Fumimaro Konoe, as quoted in Eagle Against the Sun: The American War With Japan (1985) by Ronald Spector. This remark would later prove prophetic; precisely six months after the attack on Pearl Harbor, the Japanese navy would suffer a major defeat at the Battle of Midway, from which it never recovered. Statement in opposition of the planned construction of the Yamato class battleships, as quoted in Scraps of paper: the disarmament treaties between the world wars (1989) by Harlow A. Hyde. In this statement, Yamamoto implies that even the most powerful battleships can be sunk by a huge swarm of carrier planes. This remark also proved prophetic as both Yamato and Musashi would be sunk by overwhelming air attacks. Statement made after the attack on Pearl Harbor by Yamamoto as portrayed in the film Tora! Tora! Tora!, this is one of the most quoted remarks attributed to him. Though it is thought that it summarizes his sentiments well, a definite source for this quote has never been provided. William Safire wrote that there is no printed evidence to support this quote. Safire's Political Dictionary, page 666. For more information see the Wikipedia article "Isoroku Yamamoto's sleeping giant quote". It has been declared this attribution is "unsubstantiated and almost certainly bogus, even though it has been repeated thousands of times in various Internet postings. There is no record of the commander in chief of Japan’s wartime fleet ever saying it. ", according to source Brooks Jackson in "Misquoting Yamamoto" at Factcheck.org (11 May 2009), which cites source Donald M. Goldstein, sometimes called "the dean of Pearl Harbor historians", writing "I have never seen it in writing. It has been attributed to the Prange files [the files of the late Gordon W. Prange, chief historian on the staff of Gen. Douglas MacArthur] but no one had ever seen it or cited it from where they got it." In the wake of Pearl Harbor, a single word favored above all others by Americans as best characterizing the Japanese people was "treacherous," and for the duration of the war the surprise attack on the U.S. Pacific fleet remained the preeminent symbol of the enemy's inherent treachery. The attack also inspired a thirst for revenge among Americans that the Japanese, with their own racial blinders, had failed to anticipate. 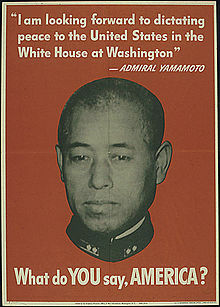 In one of his earliest presentations of the plan to attack Pearl Harbor, even Admiral Yamamoto Isoroku, who presumedly knew the American temperament firsthand from his years as a naval attache in Washington, expressed hope that shattering opening blow against the Pacific Fleet would render both the U.S. Navy and the American people "so dispirited that they will not be able to recover." Yamamoto was an aggressive and inspiring officer, but he made the error of dividing his huge force five ways and of thinking that his foe would behave in a predictable way. After his crushing defeat on Midway, he ordered a general retreat and took ill in his cabin. U.S. naval intelligence again was his undoing. When he took off on an inspection tour from Rabaul, American fighter planes were up and waiting for him. This page was last edited on 5 March 2019, at 21:23.